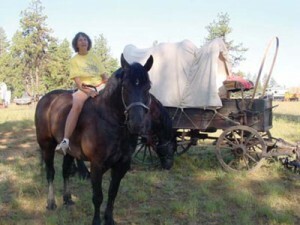 Dr. Hickey riding her favorite draft horse, Don, on her annual wagon train adventure. I am a physical oceanographer, receiving my Ph.D. degree from Scripps Institution of Oceanography (SIO) in 1975. For about 10 years I was one of two female physical oceanographers at a university in the United States. I was directed to oceanography by my physics professor at the University of Toronto, who took me aside (the only woman and the top student) and told me that theoretical physics demanded too much commitment (for a woman) and that I should look at a (softer) field such as oceanography at SIO where he had done a sabbatical and had been able to surf. My research interests have evolved over the years. My doctoral work was on equatorial processes, including El Niño. I participated in the first cruise to attempt to moor buoys in the Equatorial Undercurrent (only two stayed put!). I have been very lucky in my career—I had a good mentor following my Ph.D. (I took my assistant professor position before actually finishing my degree AND did no postdoc). Also, I entered the field of coastal oceanography in the “cowgirl” days when almost anything you measured was a new finding. My mentor passed a buoy group to me, so my career path has mostly been one of moored data collection and analysis, supplemented with CTD surveys, satellite imagery, and drifter deployments, as necessary. In recent years I have become almost more interested in inter-disciplinary than discipline-specific questions. I was lucky in that funding was much easier for everyone in my early career years. I have always been on “soft” money and I congratulate myself on keeping a group and many students funded over a 30-year period. As time passed it became necessary to have more and more grants to keep funded (I have had as many as eight simultaneously) and the fun began to diminish as more and more time was spent on writing reports, attending meetings, and writing new proposals. I was thinking of retiring early when I was awarded two five-year multi disciplinary/multiinstitutional grants to direct and participate in interdisciplinary projects. The affirmation of my skill by my peers who reviewed this work plus the security of these projects has renewed me and once again I am going to sea and highly motivated. I have never lost the excitement for the challenges and variety that an oceanography career provides. I have managed both career and family (I have two daughters) and a life (a farm and a passion for tennis), but not without some sacrifice. I cut back on meetings, panels, and going to sea when my children were young. The result is being overlooked for special awards (such as Fellow), invited speaker slots, and other forms of acknowledgement. Women were particularly overlooked in my field because there are/were so few of us to promote each other. However, I never felt that the quality or the amount of my work suffered because of my family. Note that this path requires a good and understanding spouse! Conditions are indeed different now for women in my field—we now have a quorum for discussions in the Ladies Room at meetings. No one is prohibited from going on a cruise because they would be the only female. Yet some challenges remain. A glass ceiling still exists for women in many areas of science. Women remain underrepresented in senior positions (e.g. full professors, department chairpersons) and in national and international positions that determine directions and funding for our science (e.g., membership on scientific steering committees). These are challenges that I am optimistic will be met by the present and future young women and men in oceanography.